The Island Vis is the outmost major island of the Dalmatian archipelago. It is 50 km away from the Croatian and 150 km from the Italian coast.We left Trogir early in the morning after having picked up 4 friends from Australia. A wonderful last minute arrangement to join us, all happened at 11.30pm the previous night on Facebook! Our luck is still on the up as far as the weather is going! A perfect day with clear skies and just the right winds made for a wonderful sail almost all the way to Vis island! In fact – we have been able to use the main sail, the Genoa and the Gennekar(Johann’s favourite sail!) at times on the way there! It was even more special to have them experiencing the different sails, seeing that they are not sailors themselves. For us, it was super special because as you know, 95% of the time in the Med means motoring and sailing of any kind is a wonderful treat! The Town Vis was founded by the Greeks from Siracuse in 4th century BC. It was the most prominent Greek settlement on the Eastern Adriatic coast. 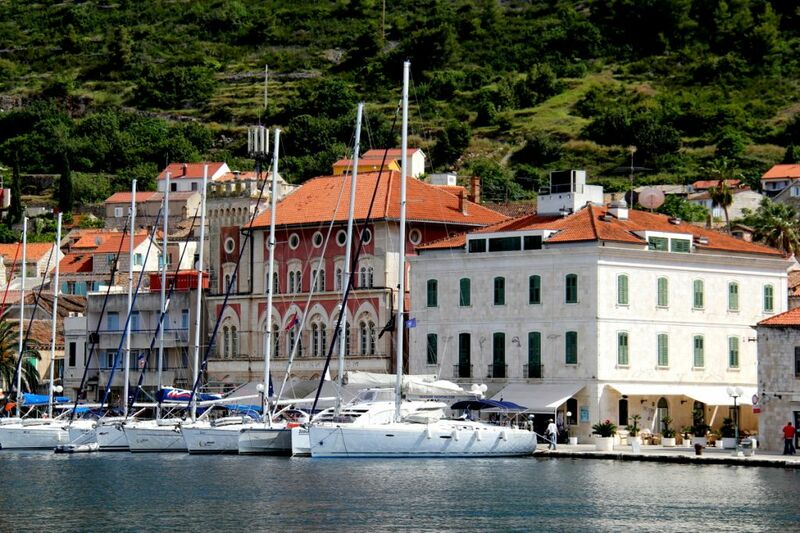 Vis harbour : A wonderful stopover. Vis town has no marina, but is situated in a large natural protective bay/harbour with a long and very popular town dock (with water and electricity available). It provides welcome anchorage and mooring space for yachts. With all the guests to be dropped off and seeing that we will only be there for the afternoon and evening (leaving early the next morning) we thought it worth being on the dock to make access to the boat less complicated. Vis is only a very small town but with surprisingly lovely buildings. It is pretty much a two street town – so it is fairly small and quiet, and maybe exactly what we sometimes are looking for when taking a break/holiday. Judging by the regular massive ferries coming and going to Vis town, there must be some worthwhile attractions on the island and pretty close by. The island has some lovely beaches – and grottos – the green grotto,the idyllic blue grotto and the eerie Monk Seal caves. It is best to visit them on a windless day and quiet seas as the entrances to the caves are so small, that any waves will make it impossible to enter. That is exactly what happened to the guests on “Finally my Darling” (also an Aussie boat, belonging to Pam and Col Darling previously from Mackay! Col was very excited to see that Scolamanzi was registered in Mackay and could not believe his luck to find the connection!) We have decided to see what the weather is like the next day before making that decision. Unfortunately, the swells were still too big and no entries were aloud to the caves. So we did not get to see them… another addition to my next time list! You have to leave something for next time, right? On our arrival with Rosemarie an Cal still on board and our day guests Jo, Ross Woodward and two of their friends Peter and Kris – that joined us in Trogir for a day sail to Vis, we could not wait to have a beer / wine at the nearest bar only meters away from where we stepped off Scolamanzi! It is always a treat to be able to sit in a restaurant or bar so close to the boat – it almost feel like a luxury extension of our living space! We had lots of fun moments to treasure for some time to come! It is amazing how the spirit lifts with good friends on board! It was wonderful and very special having to share a short day with them and after lunch (you will notice that I did not use an attributive adjectives to describe the meal), they sadly had to leave.